Speeds of 3800, 4200, 4600, and 4800 RPM allow mixing a variety of materials including amalgam, cements, and glass ionomers. Model MSD (multiple speed digital) fits most operatories. 4¾"wide, 10¼" deep, 7¼" tall. 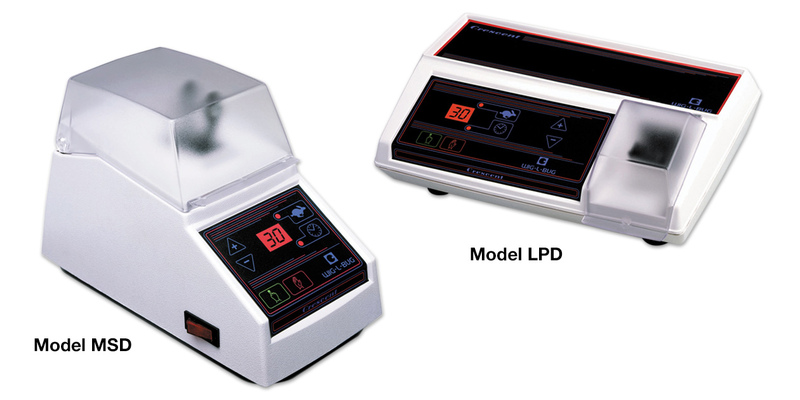 Model LPD (low profile digital) fits most operatory drawers. 11½ wide, 8" deep, 4½" tall. Both models carry a 1-year manufacturer's warranty. You are welcome to use the Wig-L-Bug amalgamator on a complete satisfaction guarantee basis; if you are not fully satisfied with this product, return it within 30 days for a complete refund. You may use one in your office on a trial basis; however, we can only accept the return of one unit in used condition.